Why then (Proactive AV asks), if you could save huge amounts of time would you still use old technology in your meetings? Research says that businesses can do everything quicker using interactive touchscreen technology in meetings as oppose to whiteboards, projectors and flip charts – all of which were invented in the 1950’s, 1980’s and 1970’s respectively! Proactive states its obvious why companies without modern work methods and tools move slowly, ultimately taking four times longer to achieve business results. It’s like going back to typing on a typewriter and sending messages using a Telex machine. Today’s Clevertouch Pro interactive touchscreens are like having a familiar, rather large, tablet on the wall. Everyone uses touchscreens in their everyday life and their first reaction is to touch a screen to use or make a piece of equipment do something. Nobody’s reaction is to want to set up projectors and write on whiteboards and flip charts. Clevertouch Pro interactive touchscreens produce a stunning image incorporating an amazing 955% more pixels than a data projector. The user can focus in on a particular detail simply by making it bigger by using their fingers or the stylus. The image (or in fact any type of media) can then be annotated upon and using a device called Montage can be shared in real time with other meeting attendees, remotely or otherwise. Even if a company uses SKYPE (or similar systems) and video conferencing, these systems are easily integrated to work perfectly with this touchscreen technology. Notes and changes to images, drawings, videos, spreadsheets and documents can all be saved on the screen via a USB memory stick or even emailed immediately to all meeting attendees before they have even left the room or got up to make a cup of tea. Gone are the days of some poor unfortunate person trying to decipher and type up notes from various pages of flip chart paper or photographs of whiteboards. Planning, drawing offices and designers will be able to view, discuss and make changes to drawings with other colleagues in the same room, building or anywhere in the world quickly, easily and simply. All colleagues can actually get involved annotating, sharing and making suggested changes to drawings in real time, saving the results and sending to relevant departments when signed off. Can you imagine how much time this saves and not only time, an environmentally aware company can cut down their carbon footprint (which is becoming more and more important) by saving on expensive travel by car, train or even plane. Using the Clevershare device supplied with each screen ensures that there is no need to plug in and connect an assortment of cables to devices making it simple for anyone to use for any meeting and the Clevertouch Auto Wipe feature ensures that sensitive material and emails are deleted each time the screen is shut down. 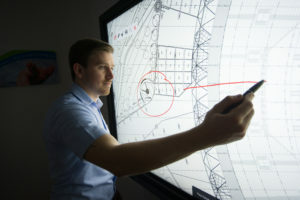 Users of the technology can create their own ‘Wifi Hotspot’ which means that the touchscreen does not need to be connected to the company’s network. Millennials (born between 1980 and 1999) are tech-dependent. It is worthwhile remembering that 78% of Millennials believe access to technology makes them more effective at work. These guys have used this technology all through their schooling and they no longer ask for sufficient technology in their jobs; they will expect it to be provided. This generation is driving the digital transformation in the workplace, especially when it comes to communication. “We all want to do more meaningful work in less or with the same amount of time. Technology enables us to optimize how we spend our days. Companies can have the most amazing perks but if you’re not able to produce work efficiently with the help of great people and technology, then massage rooms and roaming ‘cookie carts’ are meaningless” says Jeff Vijungco, vice president, Global Talent at Adobe. Proactive AV have been working with education customers since 2004 and have installed thousands of audio visual solutions, starting with interactive whiteboards and projectors and then leading the interactive touchscreen revolution in the last few years. They are an accredited partner of Clevertouch and are working with them to introduce this new corporate technology in to the business world. Not only do Proactive carry out demonstrations, design, project manage and install the solution, they provide after sales training and support to ensure the equipment is used to its full potential. Leasing and extended maintenance packages are available for as little as £159 per month. Chris Birks, Managing Director of Proactive AV says “This award winning technology is tried and tested. It is already being used in companies such as Willmott Dixon, Tarmac and B&Q and we firmly believe that once businesses use the touchscreens within their meeting rooms, drawing offices or boardrooms they will see the immediate benefits and start saving themselves £1,000’s a year in non-productive time and travelling costs. *Illustration based around salesmen living in Edinburgh, Leeds, Guildford and Cardiff and the HQ being in Cambridge. They all drive a Mondeo 2.0 TD Zetec and stay overnight in a local standard hotel (with dinner). It is based on each salesmen travelling for one day and the loss of productive work and a potential order of around £1,000 each for the day. Press release distributed by Newsmakers on behalf of Proactive AV, on Wednesday, 31 May 2017. For more information subscribe and follow https://twitter.com/newsmakers_pr .